Vomit-onomics: A tale of online reviews, chef’s hats and marauding bacteria. Friday: Peking Duck at a Peking Duck restaurant in the suburbs. Late Friday night: My partner engages in copious vomiting. Saturday: She spends the day in bed, speculating about the possible effects of so much Peking Duck. Saturday night: I discover that I too have a ticket on the vomit comet. I suppose that I also ate an excess of Peking Duck. Sunday: I spend the day in bed. Mid-week: Our housemate also falls violently ill. Speculation about the role of the Peking Duck falters and wanes. No decent alternative theories emerge. A week later: A missed call from the Victorian Government Department of Health Communicable Diseases Unit. (A frightening voice message if ever there was one). The lady on the end of the phone is duty-bound to provide no information and engage in no speculation. She’s a bug detective, not a news service. But the questions she asks tell the story. “I did,” I said, having an aha! moment. She then goes on to ask a range of questions about symptoms. She also reads out the whole menu, in a seeming attempt to isolate the cause. She tells me not to go to work if I work in the food industry. Now. It’s very nice to know that the Victorian Department of Health is out there fighting the good fight. But the fact they are involved suggests a certain level of seriousness. I wouldn’t, for example, report a quick spew to the government. But hospital emergency departments are obliged to. The fact that we passed the bug on suggests it was not your standard food poisoning, but either norovirus or Salmonella, and the fact the government cares enough to investigate may, perhaps, imply it is Salmonella, which is potentially fatal. The end point of this, and the part where economics comes in, is what we did next. The Victorian Government has not published anything about any outbreak. Of course the restaurant may be innocent. Kudos to you if you noticed they don’t match. 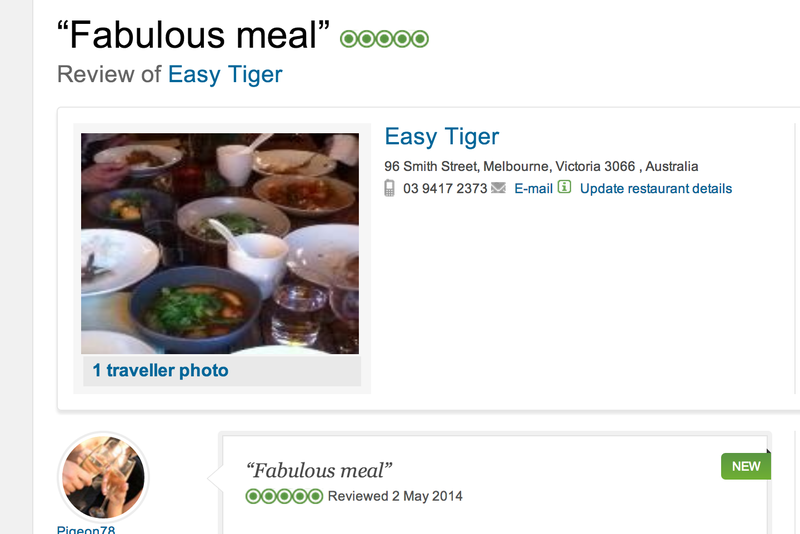 It seems to be policy to remove accusations of food poisoning from review websites, due to legal issues. We considered the possible ramifications for the restaurant of writing a review linking them to food poisoning. On the one hand, there remains a chance they are not guilty. On the other hand, making such a review could do a lot of good. If it prevents somebody with a compromised immune system from eating infected food, it could save their life. So we left a story on Urbanspoon (a restaurant review website) that delivered the facts, as I did above. A chronology of eating, spewing and taking calls from the Communicable Diseases Unit. Nothing definitive, nothing defamatory. That has since been removed from the restaurant’s Urbanspoon page (while remaining visible via the users page, which nobody would visit). If you can’t communicate assertively with your waiter, you get to rant and rave. But if something genuinely serious happens, you can’t write about it. The quality of food is what marketers call an unobservable product characteristic. You can’t know everything about it before you buy. Firms use signals to try to tell you about these unobservable characteristics. For example, they may set prices high (check), or make very public the awards they have won (check). But with food, quality has an important dimension. Will it make you sick? This dimension is one which the restaurant won’t signal, and consumers are currently blocked from signalling in the most obvious place. This blog post is therefore designed to stand in place of all those deleted reviews. I do not know for sure what made us sick, but I do know for sure that I’d like to hear about people’s reasonable suspicions before I make my next booking. Posted on May 5, 2014 Tags Economics, food poisoning, unobservable product characteristicsLeave a comment on Vomit-onomics: A tale of online reviews, chef’s hats and marauding bacteria. 1. Letting states raise income tax to pay for services. States have responsibility for things people really care about, like schools. The Commission proposes dividing up the ability to levy income taxes between states and the federal government. (States lost this power in WW2). States would start off with a 10 per cent rate, which they could then move up or down. If implemented in Australia, there’s plenty of reasons to believe this would result in higher taxes and higher quality of services. People move house to access better schools all the time. State governments live and die on stories about ambulance waiting times. Competitive federalism is a classically liberal idea. But these days one could argue the left, broadly defined, has as much claim as anyone to be the custodian of that tradition. Providing the right amount of government services efficiently is as much a left-wing idea now as right. You give your money to the federal government they will only spend it on fighter jets and diplomats. You give money to state governments, they spend it on schools and hospitals, roads and transport. 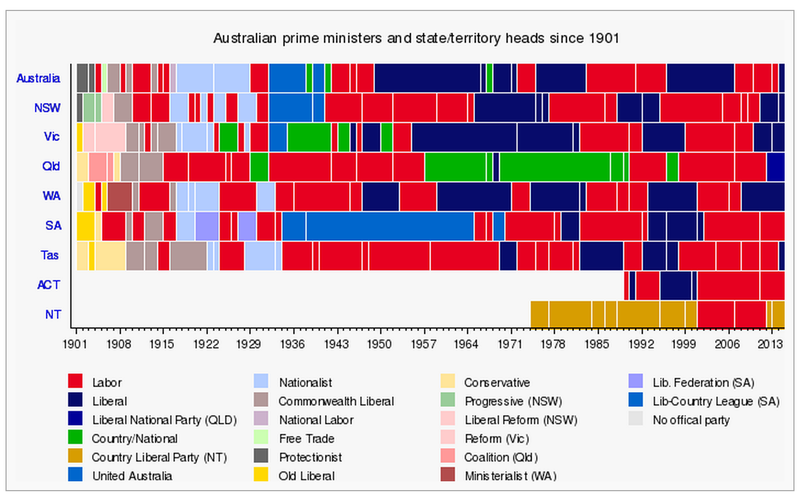 The states have been, in the last 50 years, more red than blue. Anyone who doubted states leaned left before the last SA election got a big surprise when they gave Labor another chance. Putting more tax and spending power in the hands of a demonstrably more left-wing level of government will likely lead to more spending on – and better outcomes in – health and education. If we had a lot of border towns, there would be big risks of distortion where states had different tax policies. Luckily most Australian population centres are far from the borders. The Gold Coast (QLD) is the closest big town to a border, being 23km from Tweed Heads (NSW). This idea is the only really big game changer in the whole report. Every thing else is about levels of spending or ownership of entities. This one is about the fundamentals of our Commonwealth, and it is not a bad idea. Locating responsibility for expenditure and responsibility for taxation in the same level of government makes perfect sense. Of course commentators are opposed, and it will be, ahem, looming understatement, tricky to get off the ground. 2. Paid Parental Leave to clock out at incomes of $58,000, but keep the surcharge on the profits of big business. This week, Tony Abbott cut maximum wage matching for the PPL from $150,000 to $100,000. (I estimated this would impact the payments of around 5400 women.) The audit commission argues it should be far lower, at Average Weekly Earnings, or $57,460. But the tax introduced to pay for the scheme should be retained, it argues, and spent on child care. No upper middle class welfare, and higher taxes on big business? It’s like Bob Brown himself wrote this part of the Commission’s report. 3. Cutting a promised boost to Defence spending. The Government, in its madness, has promised to boost defence spending to 2 per cent of GDP. Why 2 per cent? Not because that’s proven to be the level we need to keep the barbarians from the gate, but just because. Now, this one is a bit of a stretch. The government is clearly looking for opportunities to cut. But if you benchmark honestly, and compare the ABC to its peers, you’re going to find it hard to do anything but conclude they are very very frugal and represent a good return on investment. This excellent analysis finds the ABC spends 14c per Australian per day. The BBC gets 39c per Briton per day. Canada’s public broadcaster also gets 14c a day, but it has advertisements. The ABC, is the runaway winner. The article adds that it is 4 per cent of the price of subscribing Foxtel. The ABC gets $1.2 billion in revenue, which it uses to run 12 radio stations, a 24 hour news channel, two main channels, a kids station, an international station called Australia Network, abc news and opinion online, etc. Channel 7 has revenue of just over $1.2 billion, which it earns for running 7, 7Two and 7Mate. While the ABC pays its top stars up to $356,000, I have it on impeccable authority that ABC Melbourne journalists have to BYO teabags to work. I cannot imagine how a benchmarking exercise would find anything other than great opportunities to invest in the ABC. The Commission of Audit report contains some other ideas I regard as excellent, like cuts to industry assistance, better e-government and slashing the hell out of DFAT. It also contains ideas I oppose wholly, like restricting access to Medicare, and cutting the minimum wage. The full set of Phase One recommendations is here. Use the comments section to let me know any other parts that catch your eye! Labor’s own Crikey and ANZ’s own AFR – will branded newsrooms ever work? Yesterday the Australian Labor Party made a stir by sending out a request for donations. It wants $95,000 to pay an editor to run its own newsroom. “It will be no nonsense and it won’t be filtered through the mainstream media,” the soliciting email said. The ALP move to having its own newsroom makes some sense. The number of “news outlets” that simply regurgitate press releases these days means the writer of a decent press release has considerable power already. Might as well cut out the middle man. And the ALP is not blazing a trail. Corporate newsrooms are the new big thing. ANZ BlueNotes is especially visible to me, because on the day I left the Australian Financial Review, two colleagues of mine left to work there – Walkley award winner Andrew Cornell and BRW publisher Amanda Gome. Both people I respect a lot. – Paul Edwards ANZ group general manager corporate communications. Mr Edwards talks about a conversation. Broadcasting is easy. The most challenging part of this, I suspect, is finding people who will listen. I find the content mix at Blue Notes to be a bit ANZ-heavy to want to visit it. The top stories are mainly by staff and/or about the company. I don’t doubt that that raises the click rate at this early stage of the game – who else will be an early adopter other than staff, shareholders, interested parties? But trust issues loom largest when you are writing about yourself. So establishing a newsroom can have two goals. Making highly shareable content, or attempting to create, over the long run, a trusted destination for news. The AFL is probably Australia’s leader in having a corporate newsroom, and it does the latter. But it can do that by writing about itself. But is the AFL a good model for a bank? The AFL is in the business of making nine simple but newsworthy events every weekend. ANZ is in the business of quietly making profit. Successfully making loans and having them repaid – while as predictable as nine teams running out winner by Sunday night – offers a far less compelling narrative. A bank can expect to be in the news mainly when things go wrong. It will be interesting to see how BlueNotes responds if there is another big trading scandal, loss or personnel issue. The Betfair Poker twitter account demonstrates how self-promotion can be perceived as a turn-off, by never ever doing it. It tweets funny content utterly unrelated to the product it ostensibly promotes. A perception that your branded newsroom is too much like an ad might put me off visiting. But perhaps “visiting” the newsroom is not the point. These days, stories tend to rise and fall on their own. The statistics for this blog show me that deliberate visitors seeking out the blog provide a low background hum, but the big roars come when a story takes off on social media. ANZ’s only way to get major traffic at this stage will be writing shareable articles. BlueNotes could offer compelling stories to the general public by focussing on disasters inside the bank to which it has exclusive access (unlikely!). It will instead try to pick out meta-trends that affect readers as much as the bank itself. It is doing that to some extent, with stories on shadow banking, for example. But that story is written by a lawyer, and to be honest I didn’t read it to the end. ANZ can never be Buzzfeed, and it probably won’t publish scandals. That means all the heavy lifting has to be done by imaginative ideas and great writing, all on serious topics. It needs a lot of quality writing. That is a major challenge. And as for the ALP? Its trust issues will be greater than ANZ’s, far greater than the AFL’s. Every piece it publishes will be assumed to be propaganda suited more to the pages of Pravda. But that does not mean it can’t be shareable. Unlike ANZ, partisanship and cheerleading can work to its advantage. Core ALP supporters may be very keen to push its message so long as it is lively. Like ANZ, it is at risk of principally preaching to the choir unless the quality of the content is head and shoulders above the pack. Quality is key. And the incentives of a branded newsroom to create content that shines bright is never going to be that sharp. BlueNotes, unlike Crikey, never has to pay its own way. It does not live or die on the love that people have for it. Every story is produced with half an eye on the effect on the brand and half an eye on the appeal to the audience. So Branded newsrooms must live or die on quality, but their incentives are not as sharply arrayed to produce quality – where quality is defined as things the reader wants to read. Posted on May 1, 2014 Tags branded newsrooms, mediaLeave a comment on Labor’s own Crikey and ANZ’s own AFR – will branded newsrooms ever work?